In a pot, add water, salt and bring to boil. Skin and chop garlic and onion. Add pasta to the boiled water and cook for 8 to 10 minutes or until tender. Meanwhile, heat oil in a frying pan, add garlic, onion and fry for 1 to2 minutes. Add mushrooms, capsicum and sauté for 1 to 2 minutes. Add flour and cream to the frying pan and stir. As soon as the cream thickens, stir in the drained pasta, season with salt and pepper, then serve immediately. 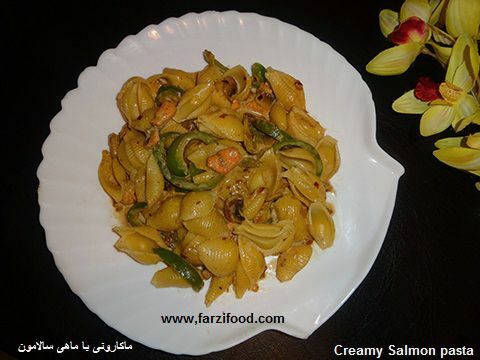 You can use any kind of fish you like to make this pasta dish.